Japanese Episode AG 111: "Rune Jimu! Mizu no Aatisuto - Adan (Zenpen)"
American Episode 382: "The Great Eight Fate!" Satoshi and his friends have finally arrived in Rune City! As the gang arrives, they view an outdoor performance by none other than Mister Adan, the water artist and leader of the Rune City Gym! After Adan takes care of an attack by the Rocket-Dan, Satoshi introduces himself and asks Adan for a Gym Battle, a request the Gym Leader is happy to fulfill. On the boat ride to his gym, Adan tells our heroes that he used to be a Pokemon Coordinator, saying how he emphasizes grace and beauty in all his battles. He also explains that he enjoys the challenges that electric pokemon pose to his water types, challenges that have forced him to come up with some unique defenses against his pokemon's weaknesses. Before long, the Gym Battle begins with a two-on-two battle, beginning with Satoshi's Pikachu and Yukiwarashi facing off against Adan's Todoggler and Azumao. Yukiwarashi is quickly knocked out and replaced by Heigani, who is able to knock Todoggler out with a Crab Hammer. 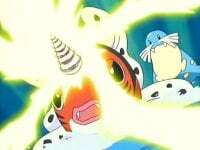 Pikachu is also able to win its bout by using Iron Tail to defeat Azumao, leaving Adan with only three pokemon. At that moment, the pool-like field changes into a more grassy field, prompting the start of the second stage of the Gym Battle: a one-on-one battle! Adan calls on Luvcus while Satoshi calls on Juptoru, who he thinks is sure to win. However, when Luvcus uses an Angel's Kiss (Lovely Kiss) attack on Juptoru, the grass-type pokemon looks stunned! Is this the end for one of Satoshi's top battlers? To be continued! The anime kind of dropped the ball on this one. Not only did they make Rune City (which I should probably spell as Runé City, since the e is meant to be pronounced) look like every other generic city in the anime, but they also made a major omission: Mikuri (Wallace)! Where is he? Why isn't he the Gym Leader? Why couldn't he get at least a passing allusion by Adan or one of the other characters? Apparently, though, Mikuri was going to be in the anime. There's a scan floating around of a page featuring the later Houen Gym Leaders, and Mikuri is included as the Rune City Gym Leader. He's even drawn in the anime's style and everything. Then Emerald came along, and, as we can see, the anime producers decided to change their plans. It's disappointing since I'm sure the anime producers were planning to do something big with Mikuri and the Cave of Origin (since it's mentioned in "A Three Team Scheme"), something that may have resulted in a good set of episodes involving Groudon and Kyogre. But instead, they gave up on all of that to advertise Pocket Monsters Emerald. Disgusting. Other than that, though, it's a pretty decent battle, even if the episode does end rather anticlimactically. "OH NOEZ GROVYLE gETS KIsSEd WilL he SuRVIVE!?" Lame. The dubbed version is actually better than I thought. I was certain that 4Kids would give Juan a very thick Spanish accent because, well, they like to typecast like that, but luckily that didn't happen. You know that if this was the One Piece dub, they would have given him a thick accent and have him make allusions to matadors and would be calling everyone "señor" and all that. Other than that, the Japanese version of this episode uses a lot of music from the various movies, the vast majority of which is replaced by 4Kids even though we know for a fact that they have the rights to use it. This episode is almost nothing but time cuts. Two seconds are cut from the title screen. OMG UNEXPECTED!! A second is cut from the shot of the boat that directly follows the title screen. A second is cut from the shot of Yukiwarashi getting shocked right after the Trainer's Choice commercial break. Sebastian: "Sealeo is unable to battle! The first match goes to the challenger, Ash from Pallet Town!" Ash: "Yeah, Pikachu and Corphish! Way to go!" May: "Ash pulled it out again!" I'll admit, I thought I heard Corphish say "Magi-karp!" at first as well. But after re-listening to the line a few times, I'm positive that 4Kids didn't goof up here. And how about May's line? Usually fans on the message boards are so quick to jump on innuendo like that, but this one seemed to have gotten by unnoticed. Are people not looking anymore, or am I just more perverted than the average Pocket Monsters fan? A second is cut from the shot of Satoshi before the final commercial break. This cut, by the way, removes an extra mouth flap that 4Kids would have had to fill.